The Borg starter deck, like all the other starter decks, contains several battle cards to introduce the concept to new players. These cards, Render Assistance and Borg Cutting Beam, can be removed unless you plan to focus your draw deck on battle. One or two copies of Salvaging the Wreckage can also be removed, as it becomes less important to retrieve your cards when your deck is larger, and you have more personnel providing the skills you'll need. The mission Assault on Species 8472 can be replaced with Assimilate Resistance, from These Are The Voyages. While the latter is slightly harder to complete, you do get to "assimilate" (the correct game term is "take command of") one of your opponent's discarded personnel when you complete the mission. It is also worth replacing Salvage Borg Ship with Plot Invasion, from Call to Arms, as it is slightly easier to complete. This will leave you with one mission requiring Cunning, two requiring Strength and one requiring either; so it would be wise to add third copies of both the Computation Drone and the Opposition Drone. Your choice of missions to attempt will then depend on which of these drones you draw and play during the game. The Reconnaissance Drone, from Necessary Evil, will be a good addition. This Drone offers at least one skill for each of the four missions, as well as allows you to download (search your draw deck for the specified card to place in your hand) a non-Drone personnel (i.e. the Borg Queen) when you play it. ("non-Drone personnel" refers to a personnel card that does not have the Drone keyword beneath its skills). Some other cards to consider adding are Adapt, the Evaluation Drone, the Negation Drone and the Reclamation Drone, all from Call to Arms; the Defragmentation Drone and Five of Twelve (Secondary Adjunct of Trimatrix 942), both from Necessary Evil; and Fourth (Neonatal Drone), from To Boldly Go. You may also want to add another Borg Cube (from Call to Arms) to your deck to make sure that you draw a ship during one of your first few turns. To round off the Borg section, here are some rare and/or premium cards that could further enhance your deck: The Borg Queen (Guardian of the Hive), from Call to Arms and Reflections 2.0, will provide you with a great way to overcome dilemmas by exchanging a Drone she is present with, with one from your discard pile. Locutus (Voice of the Borg), also from Call to Arms and Reflections 2.0, provides some skills that are near impossible to find on other Borg affiliation personnel as well as a way to score extra points. Foresight, from Reflections 2.0, allows you to cycle through your draw deck to find any card you need. Quintessence, also from Reflections 2.0, allows you to download a Borg affiliation personnel or ship at the start of each of your turns. Four of Nine (Heuristics Drone), from These Are the Voyages, lets you download two unique Borg affiliation personnel. And finally, Two of Nine (Transtator Drone), also from These Are the Voyages, is considered by many players to offer the best event destruction in the game. The Dominion starter deck, like all the other starter decks, contains several battle cards to introduce the concept to new players. These cards, Render Assistance and Cry "Havoc! ", can be removed unless you plan to focus your draw deck on battle. The Jem'Hadar, with a few exceptions, all have Strength of at least eight. This makes completing Strength-based missions rather easy! For this reason, the missions Salvage Dominion Ship and Survey Star System can be replaced with Study Rare Phenomenon and The Siege of AR-558, both from Call to Arms. All you then need to do is replace some of the weaker personnel in the deck with stronger ones. Bear in mind, though, that the Dominion ships require at least one Command star icon, and that none of the common or uncommon Jem'Hadar have such an icon. The reason most of these weak personnel are in the deck is because they provide Command-level staffing icons for the ships. The Founder Councilor and Founder Leader (Forbidding Judge) provide neither the high Strength nor the Command star icon, and can be removed from the deck. You could also remove two copies of Rak'tazan as his skills are not really needed. As you acquire more cards, you can gradually swap-out all the low Strength personnel who have Command star icons with stronger replacements. Where would the Dominion be without one of the Weyoun clones? Weyoun (Instrument of the Founders), from Call to Arms, provides an all-important Command star icon as well as every skill you'll need to complete Rescue Prisoners of War, so adding a couple of copies of him would be a wise choice. Yak'Talon (Deadly Patroller), also from Call to Arms, is another important card to add to your starter deck as he provides at least one skill for every mission. Duran'Adar (Attentive Sixth), from Strange New Worlds, is something you can add to your deck to score extra points when you complete Alpha Quadrant missions. While these non-mission points won't make much of a difference, you could think about adding other point-scoring cards so that a two-mission win becomes viable. To round off the Dominion section, here are some rare and/or premium cards that could further enhance your deck: Ikat'ika (Honorable Warrior), from Call to Arms, is one of the rare Jem'Hadar who has a Command star icon and also Strength of nine. You can even use his ability to increase his attributes by two, although he will be killed at the end of your turn if you do so. Remata'Klan (Unit Leader), from Call to Arms and Reflections 2.0, has a fantastic ability - when he is an eligible target for a random selection, you may exclude another Dominion affiliation personnel present from that selection. Our Death is Glory to the Founders, also from Call to Arms, allows you to kill a Jem'Hadar you command to prevent any event or interrupt played by your opponent. Friction, from Reflections 2.0, will slow down any opponent who isn't playing Jem'Hadar by stopping his or her personnel as soon as they are played. And finally, the U.S.S. Defiant (Commandeered Warship), from the 10th Anniversary collection, allows you to move overcome dilemmas from any of your missions to your Alpha Quadrant missions. 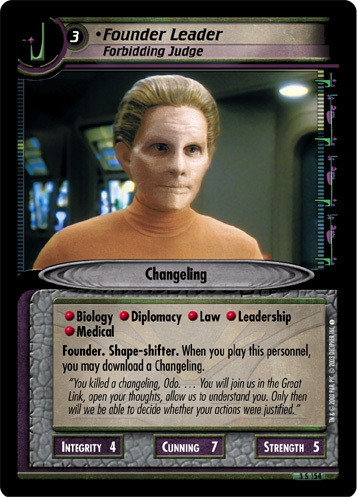 The Federation (Deep Space 9) starter deck, like all the other starter decks, contains several battle cards to introduce the concept to new players. These cards, Render Assistance and Cry "Havoc! ", can be removed unless you plan to focus your draw deck on battle. Looking through the personnel in this starter deck, you'll notice that most cost one counter to play, have Cunning of five or six, and low Strength. This shortage of high-Strength personnel in the deck makes completing Search for Survivors very hard indeed. In fact, it is worth replacing both the planet missions with Geological Survey, from Premiere; and Avert Danger, from Energize. These two missions have a lower Cunning requirement than those being replaced, as well as a similar skill requirement to the existing space missions. If you make these changes then you'll only need five different skills to complete any of the missions. While you should increase the number of personnel in the deck with any of these five skills, don't forget to keep a good selection of the other skills as well - for when you are facing dilemmas. The Medical Tricorder, Shandor, Altman, and Worf (Strategic Operations Officer) are all candidates for removal once you change the mission set. This allows you to add additional copies of Anara, Mills and T'Lor, all from Premiere, each of whom provides extra skills needed for the missions. It is also worth adding a Tricorder, from Premiere, which allows each of your Science personnel present to gain Geology. Finally, two other cards to recommend are Yelsar, from Call to Arms, and Anneli, from Necessary Evil, both because of the skills they provide. As the choice of other non-rare personnel to add is relatively slim, the Non-Aligned pool of personnel provides further recommendations. In the television show, Deep Space 9 was host to many different species from many different affiliations, so this fits well with that philosophy. Nel Apgar (Temperamental Researcher), Pran Tainer (Atrean Seismologist) and Rabal, all from Premiere, as well as Hannah Bates (Biosphere Expert), from Necessary Evil, each provide useful mission skills as well as a higher-than-average Cunning of six or seven. To round off the Federation (Deep Space 9) section, here are some rare and/or premium cards that could further enhance your deck: Kira Nerys (Colonel Kira), from Premiere, can provide an attribute boost to other Bajoran affiliation personnel when she is present with a Federation affiliation personnel. Keiko O'Brien (School Teacher), from Energize, allows you to discard a card from hand to play Bajoran affiliation personnel for one counter less than is printed. Krim (Thoughtful Tactician), from Necessary Evil and Reflections 2.0, allows you to take all copies of any one dilemma (that you name, without looking) from your opponent's dilemma pile and place them beneath your completed mission. Medical Teams, from Fractured Time, gives you a second chance to play personnel that have been killed. Defensive Upgrades, from Raise the Stakes, helps protect your events and interrupts from being destroyed or prevented. And finally, the U.S.S. 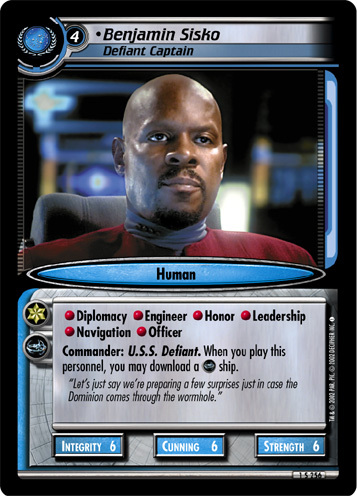 Defiant (Patrolling Warship), from Captain's Log, stops your opponent from attacking you, providing the ship's corresponding Commander (in this case, a personnel with the keyword "Commander: U.S.S. Defiant." listed under their skills) is aboard at the time.